This very popular tourist attraction is located not far outside of Krakow's salt mine in Wieliczka. Over a million visitors come here annually to see one of the world's oldest salt mines with a history that stretches back to the early 1000s. The mine officially opened in the 1200s but there is actually evidence to suggest that salt was mined from as early as 1040. Over the centuries, the mine has created thousands of jobs for several generations of Poles and has brought great income to the monarchy in Poland. The mine was actually used until 1996 when it was closed due to the severely low price of salt. What is perhaps the most interesting thing to take part in as a visitor is viewing the fascinating remnants that still remain. Most of those who worked in the mine were Catholics, and when they realized that it took far too long for the miners to get up and down for various worship services and other religious activities, they chose instead to take the church down to the mine. Among other things, they carved out a large cathedral, statues and more. Thanks to all the architectural and cultural value that is left behind, the salt mine is now on the World Heritage List. An area of Krakow which you mustn’t fail to visit during your stay is the Jewish Quarter. The Jewish Quarter is an important part of Poland's history since the country has a large Jewish population who left their mark on cities and the whole of Polish society. There is much to see and learn about how the Jewish people have lived and how they live today in Poland. When you are in town, you can visit the Izaak Jakubowicz Synagogue which is the oldest in the town (built in 1638). The synagogue shows a decent presentation of Jewish life and the history of the country. 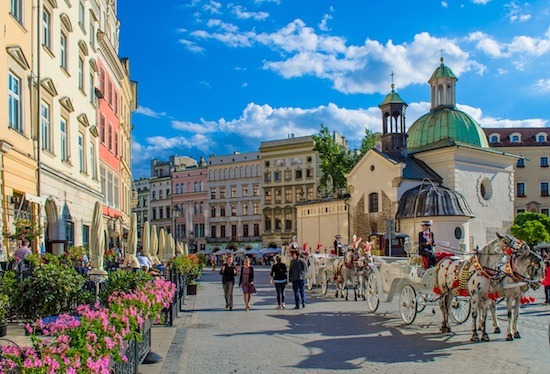 It is worth knowing that the Jewish Quarter is very popular among the younger population in Krakow, and there is plenty of nightlife and delightful restaurants serving good food. The price of food is usually lower than in other parts of the city. It's very hard to miss the huge Market Square, which spreads out in the Old City. This square is one of the largest and by far the largest originating from the Middle Ages. The area is a total of 40,000 square metres. Krakow's Market Square is a meeting place and here city residents meet daily in the market square, in one of the many bars, restaurants or cafés. Krakow Cloth Hall is a large building built in Poland's golden age and in the 1400s was a major centre for international trade. It bought and sold exotic goods such as silk, spices, leather and wax imported from the East. Even today, on the ground floor of the building you can feel a sense of what it was like to buy goods in this historic trading centre, but instead of exotic goods from the Orient, it’s gifts and souvenirs you can buy. Upstairs is the National Museum which has a large collection of Polish paintings and sculptures. The entrance to the new and spectacular museum Rynek Underground is also located in Krakow Cloth Hall. The museum area is situated in the square and on display there are some amazing exhibits about life in the Middle Ages. St. Mary's Church is located right in the Old Town and is a brick church in the Gothic style built in the late 1200s. The entire building is extremely beautiful and is one of Krakow's main landmarks. Inside the church you will find Europe's oldest wooden altar of the Gothic style, which in itself is a fascinating attraction. Something you should note is the melody played on the trumpet every hour from the top of the highest church tower. In the midst of the song, the melody is broken in honor of a trumpeter who was shot while he played in the tower when the Mongols invaded Krakow. Wawel is a building complex located on a hill just south of the Old City. On the hill you will find two more of Krakow's famous landmarks—the famous Royal Castle and the cathedral. The royal castle is an astonishing building, which until the 1500s was Poland's centre of power where for centuries the Polish kings sat and ruled the country. An interesting fact is that the castle was partially destroyed in the 1600s and 1700s when Sweden invaded Poland. The cathedral is also a very beautiful building, known primarily for all the rulers and historically important people buried there, but also for all the coronations that took place inside the church gates. Visitors can go up in the church tower for a great view of Krakow and at the same time have the opportunity to admire the ten-ton great bell Sigismund. The River Vistula runs below the hill, and this can be a pleasant place to sit down and recharge your batteries, ready for another adventure on the streets of Krakow.